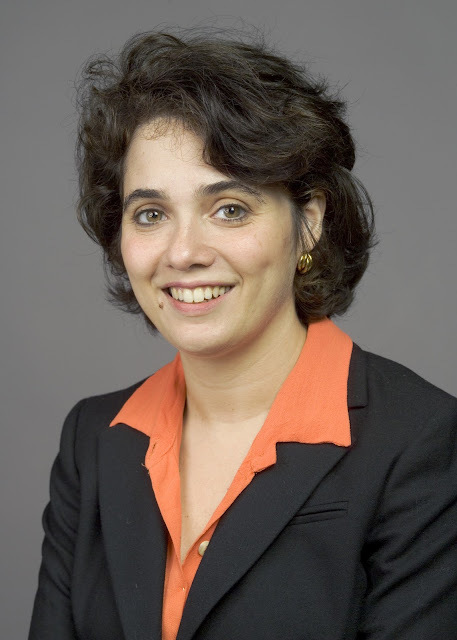 Michal Lipson recently became a Fellow of the MacArthur Foundation, the "genius" award of five-year $500,000 no-strings-attached funding. 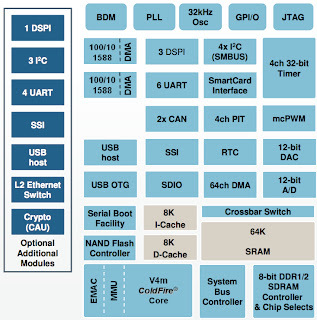 The ColdFire MCF5441x houses a 250-MHz V4m Core offering 385 MIPS, and up to 10 serial ports, precision pulse width modulators and analog to digital converters (ADCs). 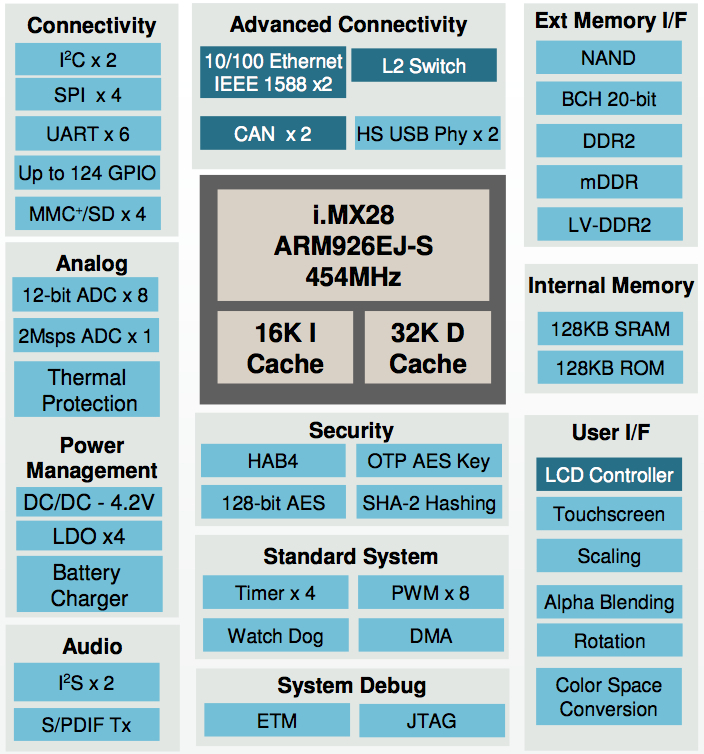 The i.MX28x chip houses a 454-MHz ARM9 core offering 500 MIPS, and LCD controller, touchscreen user interface, power management unit, two USB modules and analog to digital converters (ADC). Single-instruction Multiple-Data (SIMD) architectures perform the same operation on multiple data streams, such as multiple-users on 4G basestations, here using eight parallel operations units (op) each with three input operands. 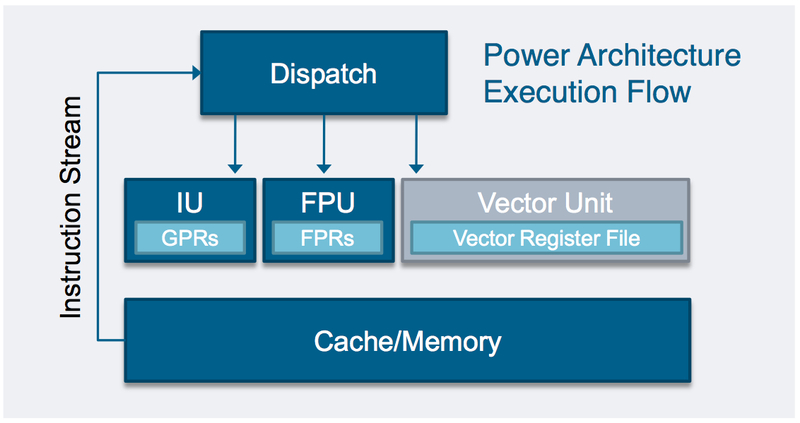 AltiVec programmable vector processing architecture incurs no penalty for mixed floating-point and integer operands since it has execution units for both. 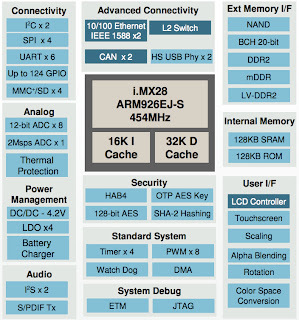 Freescale already sells legacy AltiVec processors to industry, military and aerospace customers performing traditional tasks such as image processing, pattern recognition and forward kinematics to position robotic arms as well as for emerging applications such as smart analytics on multiple surveillance cameras. 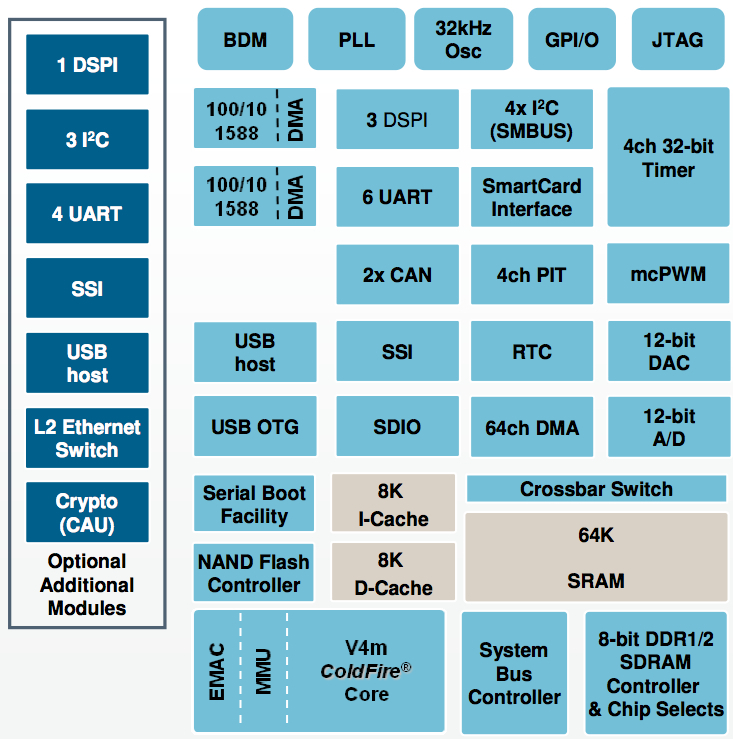 But by adding AltiVec to its leading edge QorIQ processors, Freescale hopes to expand further its penetration of the basestation processor market. 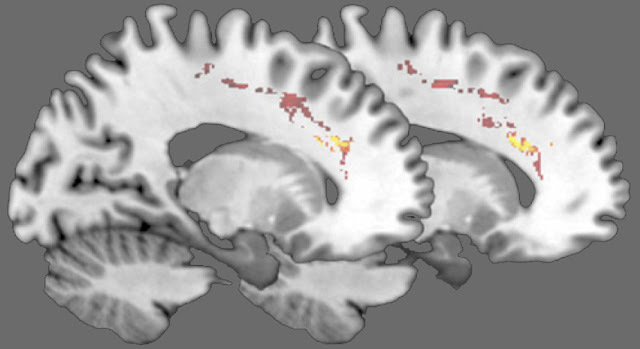 After just eleven hours of guided meditation increases in fiber strength (colored) can be measured in the anterior cingulate cortex. Here is what Smarter Technology says about meditation: Meditation was once the domain of fringe groups bent on instilling life-changing attitudes into their inductees by getting them to slow down, take deep breaths and let the stress melt away. Unproven until now, Chinese and U.S. researchers claim to have scientific evidence that guided meditation introduces positive structural changes in the brain, which help people regulate goal-oriented behaviors without all the stress. 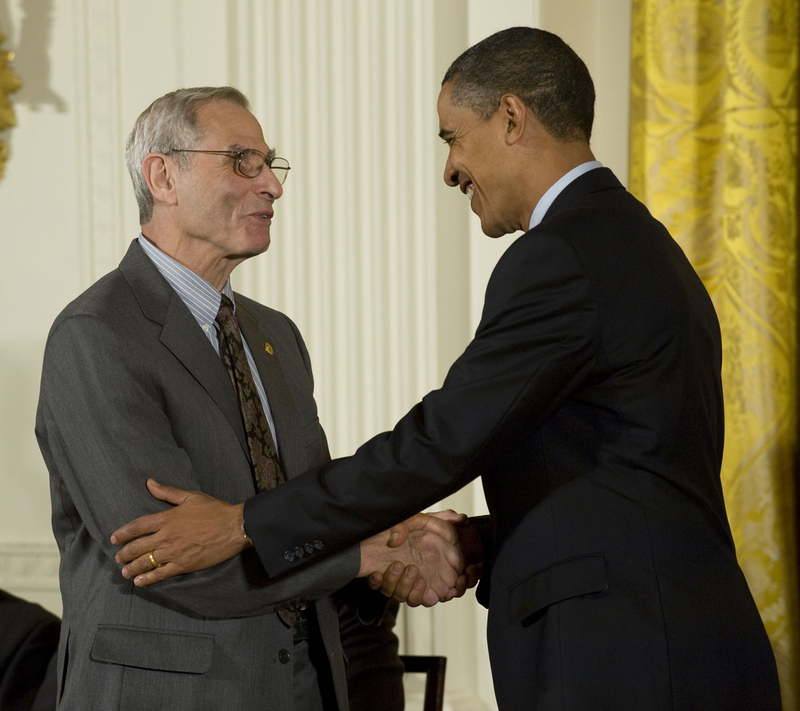 University of Oregon professor Michael Posner receiving the National Medal of Science from President Obama last year. 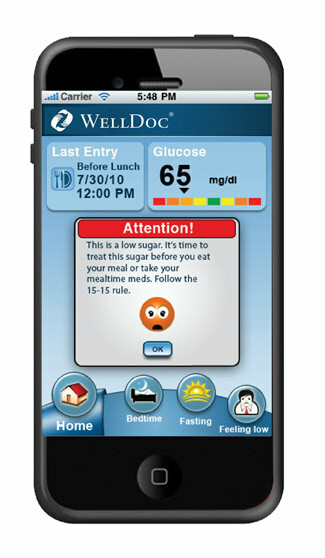 The Apps Culture population will grow from about 300 million today to almost 1 billion by 2013. Here is what EETimes says about apps: Welcome to the Apps Culture. Two years ago, it was a blip. Since then, developers have built a $2 billion market around it. The think tankers at the Pew Research Center have studied it; the trend watchers at The Nielsen Co. are tracking it. If you haven’t embraced it yet, you probably will, since ultimately every smartphone user on the planet is expected to buy into. Apps move e-commerce off the Web and onto a more secure mobile Internet platform. 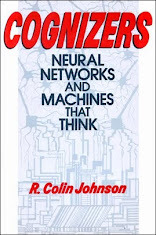 They cut through the clutter of domain-name servers and uuncalibrated information sources, taking the user straight to the content he or she already values. App downloads have been selling like gangbusters to millions of smartphone users who prefer the one-click convenience of secure paid services (think iTunes) over the Web’s arcane universal resource locators (URLs), where spammers, identity thieves, cons and malware lurk. Single-atom DRAMs offer the ultimate in memory density, where each node in their atomic lattice is encoded with a 1 or 0 (magnetic spin up or down). 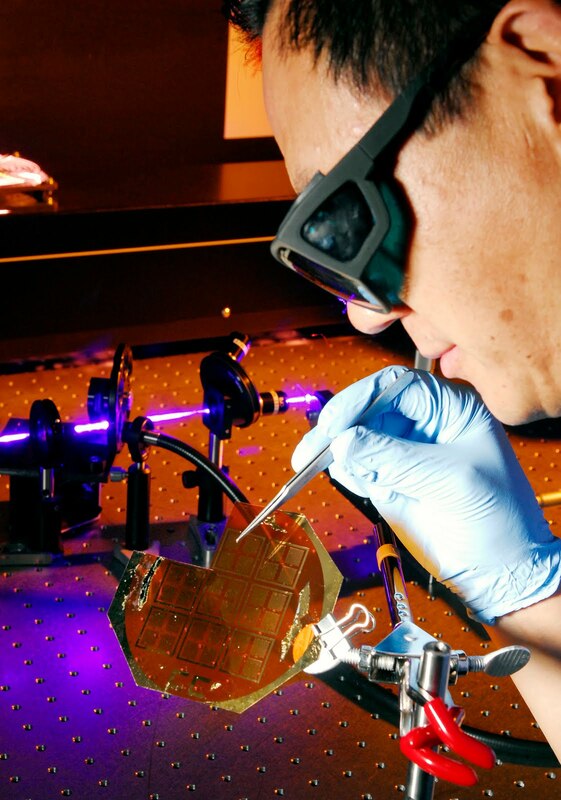 IBM's recent characterization of an atomic scale memory bit is the first step toward realization of such atomically accurate semiconductor materials. 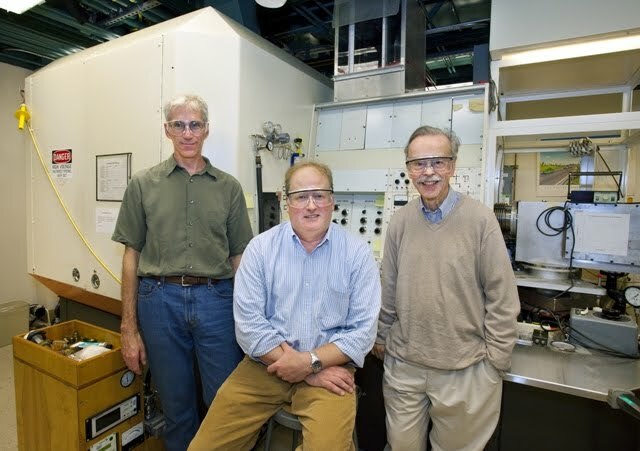 Invented at IBM in 1980, the original scanning tunneling microscope (STM) facilitated the current DRAM, flash and other memory technologies. Now IBM's new pulsed-STM can set and reset bits on individual atoms as well as turn the bit-refresh process into a super slow-motion movie. Look for current semiconductors to extend their lifetime using the new pulsed-STM method recently invented by IBM, as well as for new designer materials to be realized that finally make commercial quantum computing a reality by 2020. RColinJohnson @NextGenLog Scanning tunneling microscope topograph of a iron atom (large yellow) on a nitride-covered substrate (blue) which may someday enable single-atom bit-cells for memory chips. 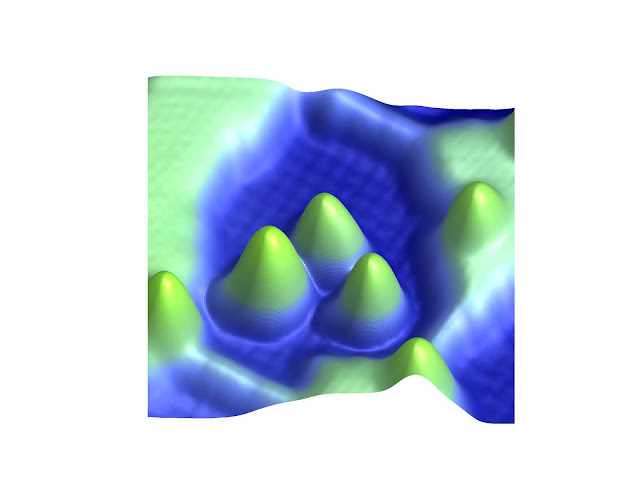 Next to the iron are two more atoms and a missing atom defect in the nitride. 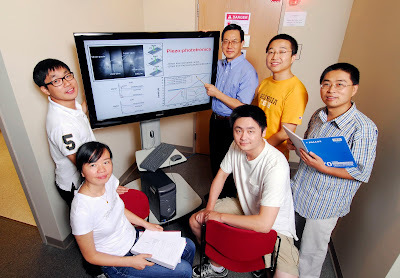 Phase-change memory (PCM) technology could profit from a new material that improves performance over traditional materials with binary eutectic-alloy nanostructures (BEANs)...formed into high density arrays of nanowires or quantum dots whose state can be switched from amorphous to crystalline in nanoseconds. 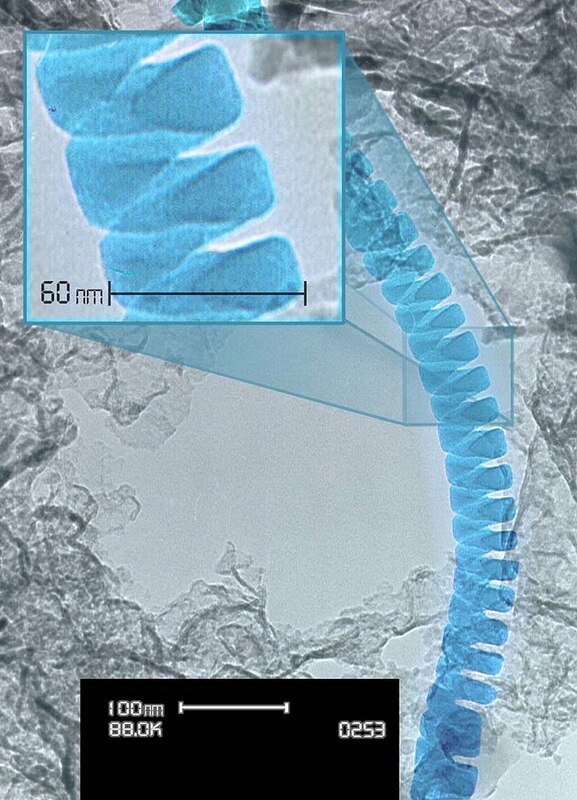 Silicon dioxide nanosprings resemble old-style curled-up phone cords. Here is what EETimes says about nanosprings: Silicon nanosprings resembling old-fashioned phone cords can carry biological catalysts for medical electronics devices, according to researchers at Oregon State University (OSU). Nanotechnology has enabled a variety of tiny structures to be mass-produced for everything from smaller transistor channels to anti-counterfeiting mechanisms. Now the commercial production of nanosprings, fashioned from the semiconductor insulation material silicon dioxide and grown using the same chemical vapor deposition process used to manufacture semiconductors, could be poised to revolutionize biomedical devices. 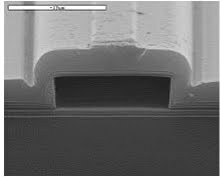 A Georgia Tech research team has developed a new class of electronic logic device in which current is switched by an electric field generated by the application of mechanical strain to zinc-oxide nanowires (credit: Gary Meek). Here is what Smarter Technology says about piezotronics: Piezoelectricity is showing promise again with piezotronics, a new category of electronic device that harnesses the relationship between mechanical motion and electricity generation in piezoelectric crystals. A wide variety of naturally occurring and man-made crystals harbor the piezoelectric effect, whereby mechanical motion and the flow of electricity are caused by each other—that is, bending a piezoelectric nanowire causes electricity to flow and, visa versa, running current through a piezoelectric nanowire makes it bend. Now, the Georgia Institute of Technology (Georgia Tech) is pioneering a whole array of piezotronic devices that use both effects—acting not only as transducers, but also as self-powered information processors. A Georgia Tech researcher manipulates and measures nanodevices based on zinc-oxide nanowires fabricated on a flexible polymer substrate (credit: Gary Meek). 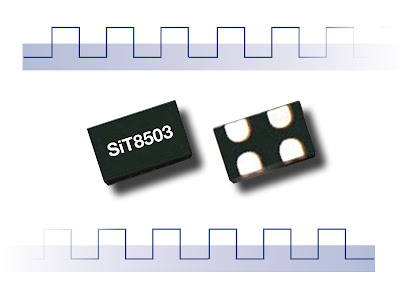 SiTime fills out its low-end with the world's first kHz-range MEMS silicon oscillator chip. 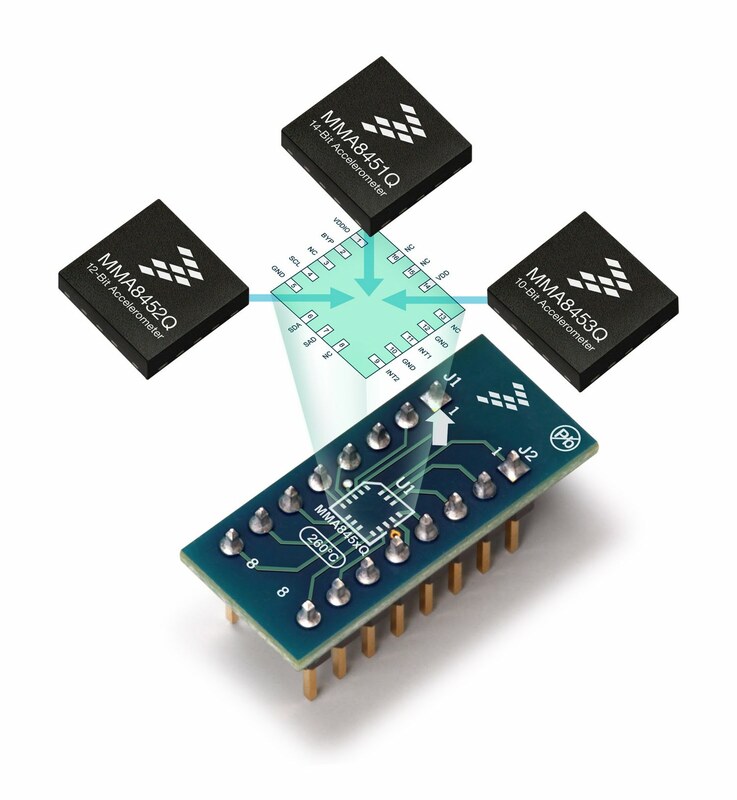 The three 10-, 12- and 14-bit accelerometers from Freescale MMA845xQ have identical pinouts. 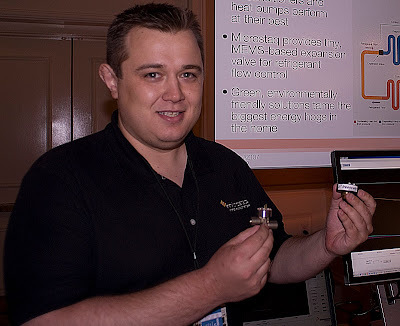 Scalable video coding (SVC) enables a single encoder to create a video bitstream that contains several bitstreams that can be separately decoded, by dropping packets, to down-sample for lower spatial resolution, lower temporal resolution or a lower quality, or a combination of the three, as required for specific client viewing hardware. WellDoc’s AI in-the-clouds gives expert advise such as directing a diabetic to consume carbohydrates, wait 15 minutes, then retest, when blood sugar is found to be low. Professor Michael Strano (left) with doctoral candidate Ardemis Boghossian (seated) and postdoctoral fellow Moon-Ho Ham who is holding their photoelectrochemical cell. 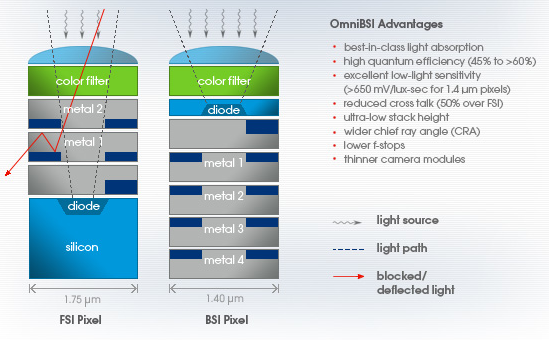 Here is what EETimes says about self-healing liquid-core solar cells: Carbon nanotubes studded with phospholipid disks enable solar cells to perform self-repairing operations similar to plants performing photosynthesis. 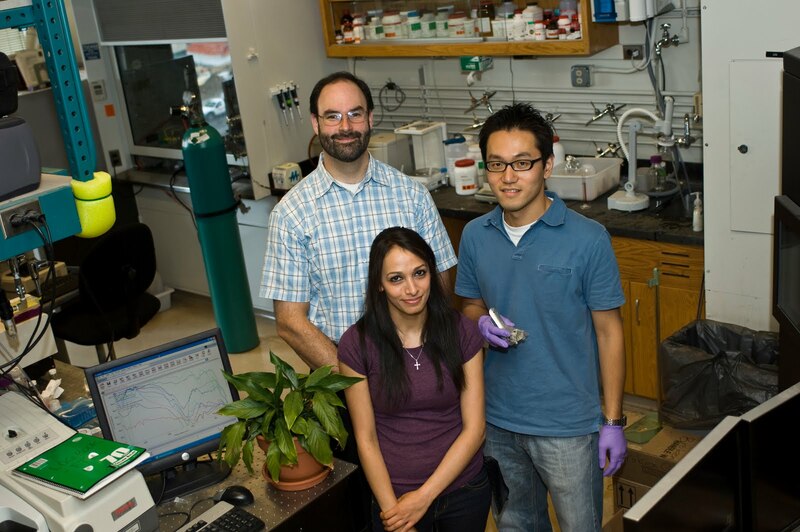 The resulting photoelectrochemical solar cells are claimed by the Massachusetts Institute of Technology (MIT) researchers to be twice as efficient as the best solid-state solar panels. 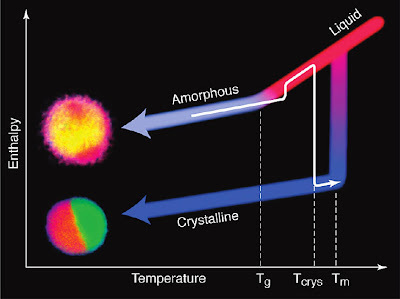 The main difference between man-made and natural solar power conversion is that engineers aim to armor solar cells against gradual degradation with solid-state inorganic materials, whereas natural solar conversion uses photosynthesis to anticipate and repair inevitable damage to liquid-state organic materials. Scanning electron microscopic (SEM) image of hollow on-chip silicon waveguide produced by the Applied Optics Group at University of California at Santa Cruz. UCSC fabricates arrays of waveguides on a single four inch silicon wafer, here showing 32 atomic spectroscopy chips using them. 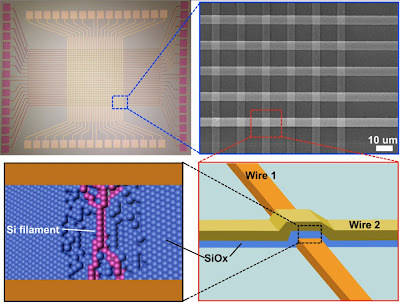 Silicon-on-insulator (SOI) process technology enables silicon photonic components capable of terabit per second speeds on broadband core networks. 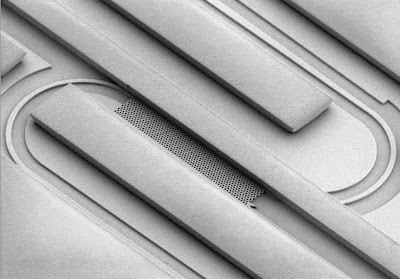 Silicon photonics sculpts out optical waveguides on standard CMOS chips, here a filter for optical fibers. Here is what Smarter Technology says about fiber optics: Today, fiber-optic communications are ultra-high-speed, but also ultra-high-cost compared to conventional copper wires. But by recasting photonics onto silicon chips, instead of the exotic indium-gallium-arsenide compounds used today, a mass market for fiber optics will result. The European Union is planning to play a leadership role. 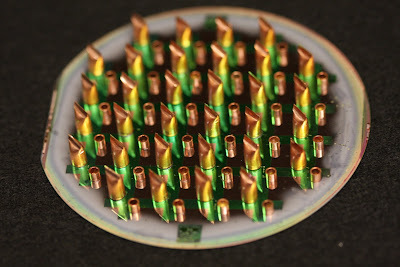 The European Silicon Photonics Cluster is a multiyear, $36 million effort that aims not only to develop the technology but to raise awareness of silicon photonics and its potential applications in optical communications, optical interconnects between semiconductor chips and circuit boards, optical signal processing, optical sensing and biological efforts. 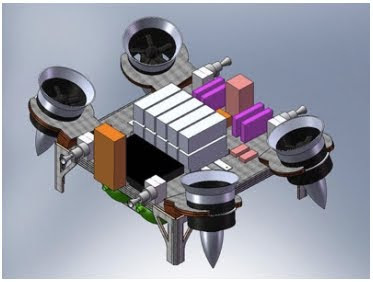 Talaris consists of the carbon fiber vehicle, four electric ducted fans to simulate lunar gravity, lithium polymer batteries to power the fans, compressed gas thrusters and nitrogen tanks to provide the fuel and thrust to maneuver the vehicle. Here is what Smarter Technology says about the new rover design: The rover called Spirit has become a "stationary science platform" on Mars, but not by choice. After months of attempting to free its wheels from a Martian sand trap, NASA has simply given up. That gave NASA astronaut Jeffrey Hoffman, now a professor at the Massachusetts Institute of Technology, an idea: why not equip rovers with a gas thruster that allows them to rise above obstacles? 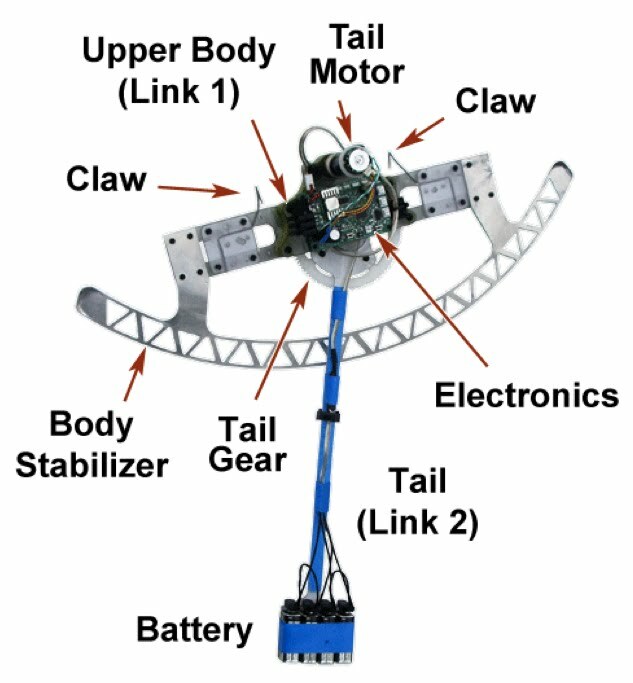 The result is called the Terrestrial Artificial Lunar and Reduced Gravity Simulator, or Talaris, as described at the American Institute of Aeronautics and Astronautics Space Conference in late August. 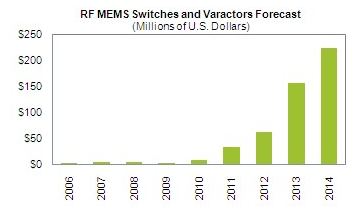 The iSuppli global market revenue forecast for RF MEMS switches and varactors from 2006 to 2014. Here is what iSuppli says about RF-MEMS: Help may be on the way for iPhone 4 users frustrated by dropped calls with the arrival of Radio Frequency Microelectromechanical Systems (RF MEMS), semiconductors that can improve the performance of antennas in cell phones...Long plagued by technological hurdles and other disappointing setbacks, RF MEMS are finally ready for the big time, with revenue projected to double in 2010 and more than triple in 2011. 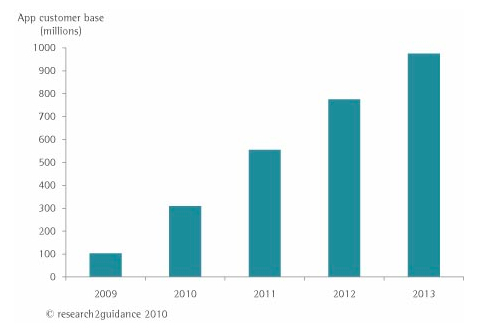 From slightly less than $4 million in 2006, global RF MEMS revenue is anticipated to climb to $8.1 million this year—and then surge to $27.9 million in 2011...By 2014, revenue will reach a whopping $223.2 million. 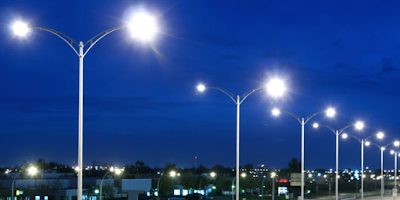 Arrays of tuning capacitors that can by dynamically switched in and out of circuits tune a cell phone's antenna in realtime to improve reception and mitigate dropped calls. 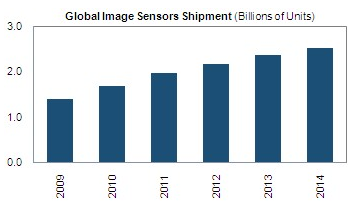 iSuppli’s image sensor forecast from 2009 to the end of the forecast period in 2014. 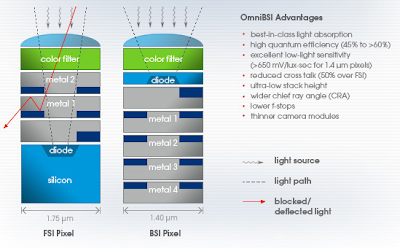 Here is what iSuppli says about BSI: Backside Illumination (BSI) sensors—the sort used in the mobile camera of Apple Inc.’s iPhone 4—are leading the charge in a newly resurgent market for image sensors in general, and other handset manufacturers are likely to follow Apple’s bold move to boost image-capture possibilities in smart phones, according to market research firm iSuppli Corp. Shipments of BSI sensors for mid- to high-end smart handsets are projected to reach 33.4 million units in 2010, up from virtually nil last year. The market will continue to post sizable increases during the next four years and rise almost tenfold to over 300 million units by 2014, consumer electronics research from iSuppli indicates. 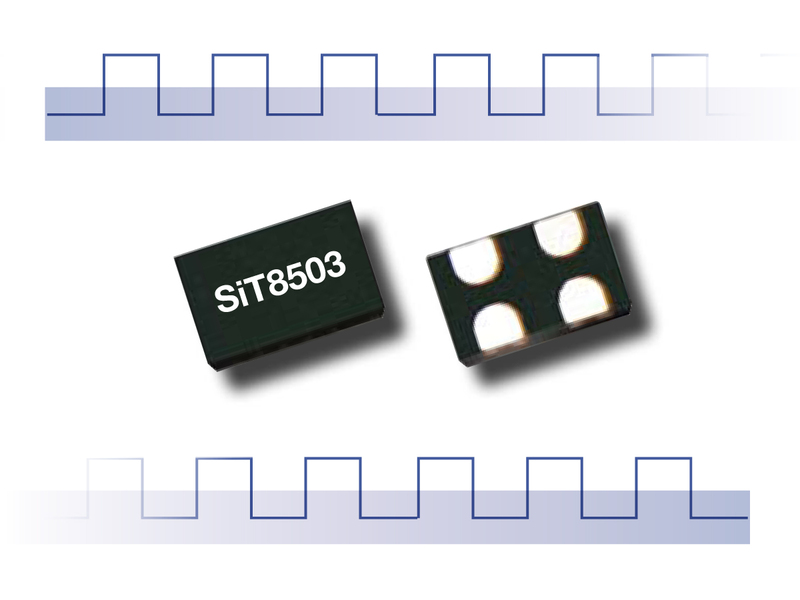 Here is what EETimes says about piezotronics: Piezotronic transistors harness the piezoelectric effect in zinc-oxide nanowires to transform mechanical motion into a signal that controls arithmetic—logic operations. Researchers at the Georgia Institute of Technology recently demonstrated their new breed of piezotronic circuits performing standard digital circuit functions. Freescale Technology Forum demonstration features Microstaq MEMS valve controlling a conventional HVAC system. Rocking-climbing-oscillating robot (ROCR) uses a pendulum-like tail (using its battery as balast) to gain height which it uses to ratchet upward claw-over-claw style.